Those aren’t just hoplites in that image; those are runners, taking part in the Ancient Greek sport of running in armour. 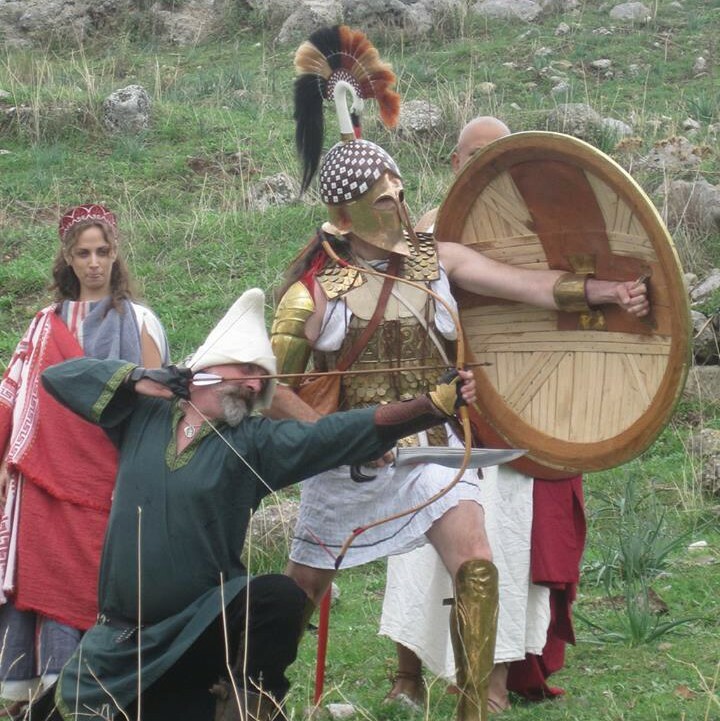 The last two big reenactments we’ve held in Greece, we’ve actually run the race in armour; sacred games to the memory of the dead of Marathon (and Plataea) were part of the religious practice, and we recreate some of that, too. But today’s blog is about building kit for Plataea, and the cheapest, best kit you can build, if you want to go reenact in Greece for seven days, or just live a better, longer life, is your body. You see all those pictures where Greeks are naked? In the military classes, having a well-toned body was a visible sign of your fitness to take on the role of a citizen; to fight in the phalanx, to vote, to consider the complex issues of ‘politics.’ There was no higher fashion than fitness. This passion for fitness was not limited to men; women ran races, lifted weights, and shot bows; indeed, an strong argument can be made that the whole institution of Brauron, a temple of Artemis in Attica, was purely for the training of Athenian girls in archery, horseback riding, running, and other sports. Look, I’m not particularly interested in the world of fitness and routines and all that. I’m mostly interested in two things; people fit enough to reenact for a week in Greece (and ENJOY it) and people with enough stamina to do some training in various Greek martial activities. That said, you’ll have a much better time if you are fit. You will also look more like an Ancient Greek. Look at the iconography; look at the representations of men and women on vases and in statues. Side note: You will not be asked to stand around naked. But people did. Young men apparently went out wearing only a chlamys (a short cloak) to show their fitness (possibly to appeal to the girl or boy across the street, too, but we leave that for another blog). Next week, when we talk about making basic clothes for men and women, you’ll see how very little you are wearing… (which is a benefit in Greece in July, I promise). Okay. Fitness. How to get there? Run. Or walk. Maybe both. If you start slowly and run just 30 minutes a day, three times a week, from now until July 2021, I guarantee that you will have the fitness and stamina to take part in every element of our reenactment. And reenacting is fatiguing, whether you are answering questions from excited school groups or marching for miles across the ancient battlefield, on the look out for the deadly Persian Cavalry (we are doing that, btw). Cooking all day is fatiguing; weaving all day is fatiguing. Its all more fun if you can do it without feeling physically ill. Don’t be ‘tough.’ Be ready. In the preparation, I walked hundreds of kilometers, and then, on Camino, another 400 or so. Walking is fabulous exercise. You just need to do a lot of it. Build up to an hour a day. Or even more. Side benefit; I got to know my city in ways I’d never seen Toronto before. Walking is remarkable (I know, much smarter people than me have said this) because you have time to look around.